In “The Return, Part 12,” Sarah Palmer warns her young cashier, and us, “Things can happen! Something happened to me.” In “The Return, Part 15,” something is happening, and as entertaining as the show’s winding, ominous roads have been, it’s energizing to see the show reach a crossroads, even if it’s not clear what lies ahead. Whatever is happening in “Part 15,” it’s turning up the electricity and cranking up the volume. Everyone on Twin Peaks is on the threshold of something, and the good, the bad, and the ugly are all revving up into the red. Let’s start with the good, the sweet, the long-awaited. Big Ed Hurley’s got his freedom, joyously volunteered by Nadine, who walked all the way to the Gas Farm to tell him the good news. Norma lets Ed wait an agonizing few minutes, but then she gets her freedom, too—from the hard work of parrying the franchise’s demands. She’s freeing herself up to spend more time at home with her family. “I thought you told me you don’t have any family” Walter says, almost accusatory. But she does have a family, and now he’s free to be with her and she’s free to be with him. The camera, the lighting, and the postures of the actors do nothing to disguise Peggy Lipton and Everett McGill’s age, because their age is part of their love story. As Ed bounces into the Double R, Otis Redding sings “I’ve Been Loving You Too Long”; as Ed sits with his coffee, bereft that Norma’s walked away from him, Redding sings, “My love is growing stronger as our affair grows old.” Their love isn’t young, it isn’t giddy, it isn’t budding. Their love is in full flower—or, as Harriet Hayward might put it, in “the full blossom of the evening.” The evening of their lives is here, and they’re going to spend it together. After longing for each other their entire adult lives, it’s a moment worth savoring, and the camera lingers for a long minute on the blue sky as if to give us, and them, a window of serenity to enjoy it. If Ed and Norma are entering their evening, Margaret Lanterman has reached the night. Once again calling Hawk with advice, Margaret tells him, “I’m dying.” Hawk has the quiet compassion to simply say “I’m sorry, Margaret,” then trust her to know he’s listening, and Michael Horse has the gravitas to give that stillness its own depth. In the premiere, “Hawk and Margaret’s ‘goodnight’s were really goodbyes,” and they stay that way to the last; even ending this last phone call, Hawk gently says, “Good night, Margaret,” only adding “Goodbye, Margaret” after the call is ended. But Catherine E. Coulson carries this scene, her side of which was filmed before her death in 2015. She delivers lines like, “You know about death, that it’s just a change, not an end” and “There’s some fear. Some fear is letting go” directly to the camera, her eyes glimmering with fear, sorrow, resignation, courage, and, above all, life. Margaret’s monologue is an unflinchingly frank last performance from Coulson and a well-deserved elegy for the actor and the character—so well-deserved that though the premiere was in part dedicated to the memory of Catherine E. Coulson, “Part 15” is dedicated to the memory of Margaret Lanterman. 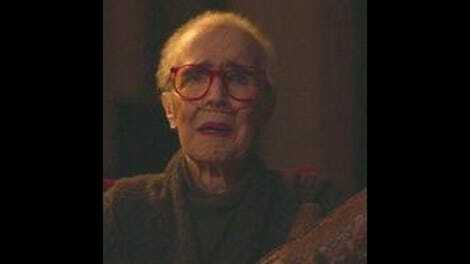 While Norma and Ed are finding the peace of a long-denied love finally allowed to bloom and Margaret is meeting her death with dignity, a touch of fear, and a final piece of advice for Hawk, Gersten Hayward and Steven Burnett are cowering in the woods, crying in each others’ arms as she tries to talk him out of shooting himself. Surprised by a man walking his dog, Gersten runs behind the massive tree where they’ve nestled, then hears the single shot of Steven’s gun. Like Norma and Ed’s modest love scene, this scene with Steven and Gersten ends with the camera panning across the sky, this time as Gersten stares vacantly up at the treetops, unable to check on Steven just a few feet away. Far away in Las Vegas, another pair of lovers stare up at the sky. As comfortable strutting into a luxury corner office in Louboutins as she is hunkered down in a sniper’s van gnawing on Cheetos, Chantal kills Duncan Todd and his assistant in seconds and returns to their van where Hutch is waiting with her dinner, ready to pontificate about their murders as just one more piece of the American dream. “It’s a nation of killers,” Hutch tells her as she nods and chomps into her burger. Together, they crane to look up at the beautiful sky, and together they pledge their love to each other. Also in Vegas, Janey-E Jones is content. “It’s like all our dreams are coming true,” she tells the man she thinks is Dougie. Apparently Janey’s made room in her dreams for a bumbling, parroting husband incapable of independent thought or action. 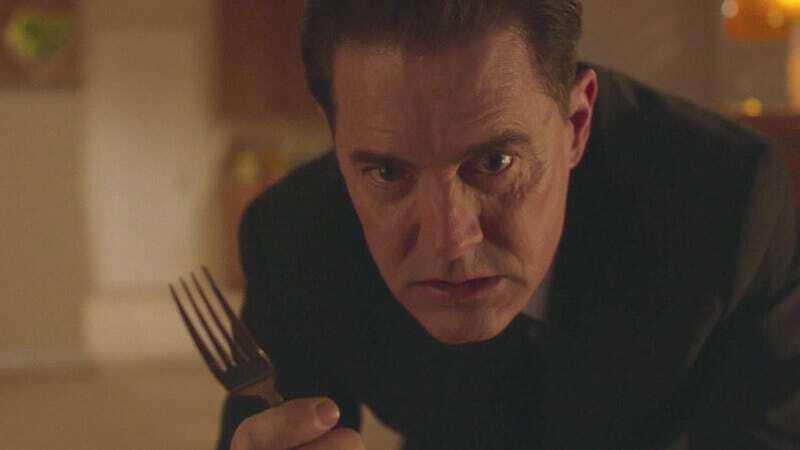 Then, thrillingly, Dale Cooper shows himself capable of more independent action than at any time since his return. As he sits, obediently eating his chocolate cake and fiddling with objects on the table before him, he accidentally turns on the television. Sunset Boulevard seems to capture his attention, but no more than a flag or The Clapper. At first, I thought it was Norma Desmond (Gloria Swanson) rejoicing at the thought of “the old team together again“ that sparked his interest, but instead it’s Cecil B. DeMille muttering to an underling to “Get Gordon Cole” on the phone that galvanizes Dale Cooper. Just grabbing for the remote to turn up the volume displays more action and agency than all his wandering, doodling, and fortuitous fumbling since he’s returned to this plane. But when he grabs his fork and crawls across the carpeted floor toward the electrical outlet (and toward the camera in a scene reminiscent of Bob clambering his way through the Palmers’ living room), it’s electrifying in more than one way. Finally, Dale Cooper is on the threshold of returning to himself. Audrey Horne is on some kind of threshold, too, and reluctant to be there. For three episodes now, she’s been trying to persuade Charlie to take her to the roadhouse to look for Billy. Now that Charlie’s finally ready to step out the door, Audrey’s the one dragging her heels. This conversation (also drawn out over three episodes) is deeply strange, uncanny even in the Lynchian world. The tone of their dialogue isn’t in key with the content. Charlie’s deadpan and Audrey’s bewilderment make it sound like he’s tormenting her even when he’s just repeating facts. Then again, that’s the nature of gaslighting. It sounds eminently reasonable, which is why it’s such torment. But Charlie isn’t the one preventing Audrey from opening the door, from leaving this house that is the only place she’s been shown in Twin Peaks: The Return. In “Part 15,” each time Charlie prods her to put her coat back on so they can head to the roadhouse, Audrey distracts him by picking one fight after another. “You’re the one that wanted to go to the roadhouse, not me,” he points out, and Audrey shoots back, “It’s impossible!” apparently about trying to reason with him, but also perhaps about the act of crossing that threshold. In tragic Lynch tradition, Audrey seems to be in a liminal place that mimics the real world (or, as Dale Cooper might say, what we perceive as the real world) eerily well, but with a few uneasy lapses. And she’s either unable or unwilling to test the threshold. Dark Coop crosses threshold after threshold in search of Phillip Jeffries. He climbs a staircase outside the terrifying convenience store where the woodsmen congregate, vanishing as he ascends, climbs another staircase, then is led down a corridor (which flickers in and out of existence in the woods), only to find himself in a motel parking lot. It’s a little journey of impossibility preparing him, or us, for his equally impossible meeting with Phillip Jeffries. David Bowie’s 2016 death made it impossible for him to reprise his role except in footage from Fire Walk With Me. In “Part 15,” the long-missing Jeffries is portrayed as a creaky pylon breathing out smoke (and Jeffries’ words, voiced by Nathan Frizzel). The-Dalek-that-would-be-Jeffries exhales in its smoke a series of numbers that Dark Coop jots down, but otherwise their conversation (about Ray, about Judy, about who’s been calling Dark Coop) seems to spin in circles. When Frank Truman hears the Log Lady has died, he removes his hat. For those of you keeping track of Twin Peaks’ numbers, Dougie and Janey-E’s street address is 25140 Lancelot Court. That’s Charlyne Yi crawling through the crowd at the roadhouse, first weeping, then screaming. It’s worth noting, weeks later, that Charlie does tell Audrey one big fat gaslighting lie in their first conversation we witness. “Audrey,” he says oh-so-tolerantly, “you know I don’t have a crystal ball.” Right in front of him as he says it is… a crystal ball.